Original non-standard advertising playing cards for Capel Vinos S.A. (vineyards), Murcia (Spain), manufactured by Naipes Comas, 2001. The images are designed in an energetic style resembling woodcut, depicting traditional regional costumes and symbols of agricultural production, by Raul Rubio, whose signature appears on the four Aces. The four suit symbols are Lemons, Pruning Saws, Aubergines and Wine Skins. 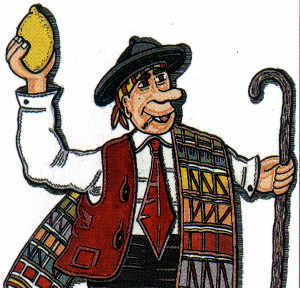 The Ace of Coins also has a lemon motif at the centre with the legend "El Limon de mi Tierra Perras". The four 'Knaves' are female and the four 'Cavaliers' are in fact riding donkeys. 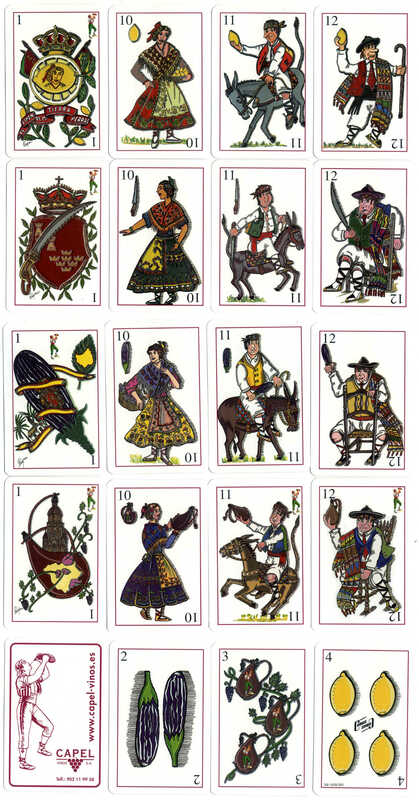 The image of a man drinking from a wineskin (bota de vino) appears on the reverse of the cards, also superimposed on the four Aces as well as the 11 & 12 of Wineskins. Above: non-standard advertising playing cards for Capel Vinos S.A. (vineyards), 40 cards, manufactured by Naipes Comas, 2001.